The International Logistics Expo & Congress (SIL) alongside the eDelivery trade fair have kicked off in Barcelona with an eye to the future of the booming sector that is electronic commerce. Running from June 5 to 7 and taking place at the Montjuïc space of the Fira de Barcelona, located near the centre of the capital, the parallel trade shows are showcasing the latest in logistics technologies. Barcelona itself is becoming more and more of a hub in the world of transporting goods, with the installation of logistics centres such as that of Amazon. Over the years, the internet has changed the way people shop. In this ever-evolving new territory in which we find ourselves, come new challenges for companies to overcome. Some of the new products on display at eDelivery include technologies to cover the so-called “last mile.” This is the final trajectory for packages bought online before they reach the consumer’s home. With more than half of the world’s population living in a city, often the final destination is found deep within the urban sprawl. The most sustainable options dominate. Companies exhibited transport solutions in the form of electric vans, three-wheel electric vehicles designed to be more agile in cities, and the Scoobic. Scoobic, created by Seville-based company Passion Motorbike Factory runs on 100% electricity. 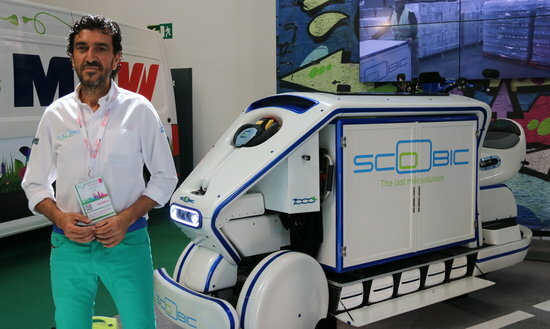 Loaded like a van, but as manoeuvrable as a scooter, with Scoobic the Andalusian firm aims to revolutionize delivery services in urban areas, thus conquering the aforementioned last mile. The Catalan start-up Nektria presented a technological platform that allows clients to choose delivery timeframes, paying more or less depending on when they receive their goods. At SIL, some of the key sectors represented are freight services, logistics management, IT solutions and storage. As the world of business constantly advances, industry 4.0 plays an ever more present role. At SIL, an entire zone has been dedicated to the so-called fourth industrial revolution, in which cutting edge technologies reign. 650 companies are taking part in this year’s SIL, 10% more than 2017. The fair is the south European launching pad for the latest trends and innovations in the supply chain. One of the highlights is the company Elioport’s fleet of self-loading and unloading robots, also aimed at tackling challenges presented by the last mile, as well as a conveyor belt used by Amazon. Other innovations include various software solutions, such as the application of blockchain technology in freight transport. In the Barcelona metropolitan area, the Mas Blau industrial estate has received much logistics investment from multinationals such as Amazon. The e-commerce giant set up a high-tech logistics centre in the zone located right next to the capital’s airport. Inaugurated last year, and as part of a multi-million euro investment project in Catalonia, the centre employs the latest in industry 4.0 technology, using robotics and artificial intelligence alongside humans to carry out logistical tasks. It is expected to be fully operational within two years.